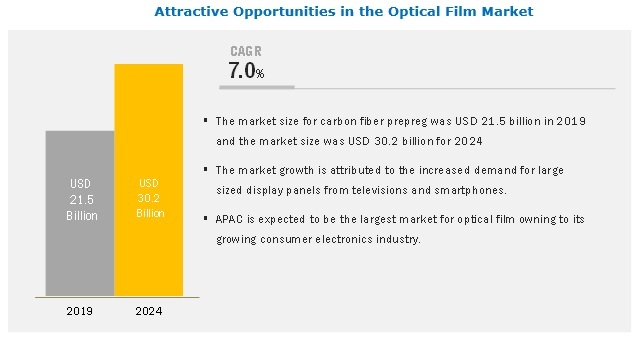 [113 Pages Report] The optical film market is projected to grow from USD 21.5 billion in 2019 to USD 30.2 billion by 2024, at a CAGR of 7.0% between 2019 and 2024. The market is growing due to the increasing demand from the televisions and smartphones & tablets application for large display panels. The television application is expected to be the largest consumer of optical film, globally. The major applications in the optical film market include television, smartphones & tablets, desktop monitors & laptops, signage/large format display, and automotive display. The television application accounted for a major share of the market, in terms of value and volume. High acceptance of optical film in LED and LCD is the key reason for the high consumption of optical film in the television application. This growth is driven by the increase in the screen size of LCD and OLED displays of televisions. A number of consumer electronics industry leaders produce LCD televisions in varying sizes and configurations due to the increase in demand for larger television units among the end users, which, in turn, is supporting the growth of the optical film market. The polarizing film segment dominates the overall optical film market, in terms of value, as it is widely applicable in both LCD and OLED displays for various applications. Polarizing film converts non-polarized light into linearly polarized light by transmitting only the incident beam that propagates in one direction and absorbing all other beams. Recognizing letters and graphics without the polarizers would be impossible. A polarizing film is one of the core elements of LCD and OLED technology that enables display of images on LCD and OLED screen. APAC is expected to lead the optical film market during the forecast period. APAC accounts for the largest market share of optical film, globally, due to the rapid growth of end-use industries such as consumer electronics, automotive, industrial, optical equipment, and lighting. Countries in APAC such as South Korea, China, and Japan have the presence of the largest optical film manufacturers, globally, such as LG Chem, Ltd. (South Korea), Hyosung Chemical (South Korea), Toray Industries Inc (Japan), Sumitomo Chemical Co., Ltd. (Japan), Zeon Corporation (Japan), and Kolon Industries Inc. (South Korea). All these factors are driving the demand for optical film in the televisions and smartphones & tablets applications in this region. The optical film market comprises major solution providers, such as LG Chem, Ltd. (South Korea), Hyosung Chemical (South Korea), Toray Industries Inc (Japan), Sumitomo Chemical Co., Ltd. (Japan), 3M (U.S.), Zeon Corporation (Japan), Kolon Industries Inc. (South Korea), Sanritz Co., Ltd. (Japan), Nitto Denko Corporation (Japan), and Samsung SDI (Japan). In March 2017, Sumitomo Chemical increased the production capacity of its film-based touchscreens panels for flexible OLED displays. Due to increased demand for OLED displays, the company has increased the production capacity of films-based touchscreens, which, in turn, will drive the optical film market. In October 2018, Zeon Corporation expanded the production capacity of ZeonorFilm optical film. The company plans to expand its manufacturing plant in Takaoka City, Japan. Due to the increasing demand for optical films, the company expanded its production capabilities. The operations are expected to begin from October 2019, which will help the company to grow its optical film business as well increase its revenue. In May 2015, Samsung SDI signed Memorandum of Understanding with China’s Wuxi City for building a new polarizer plant to cater to the increasing demand for big screen TV from China in the polarizing film market. The company has planned to set up a production line so that its products can be applied to the biggest market of eighth-generation LCD panels. What are the major applications of optical film? Which industry is the major consumer of optical film? Which region is the largest and fastest-growing market for optical film? What are the major film types used in optical film? 10.4 Sumitomo Chemical Co., Ltd.
10.11.7 Cheng Mei Materials Technology Corp. The study involved four major activities in estimating the current market size for optical film. Exhaustive secondary research was done to collect information on the market, the peer market, and parent market. The next step was to validate these findings, assumptions, and sizing with industry experts across the value chain through primary research. Both top-down and bottom-up approaches were employed to estimate the complete market size. After that, market breakdown and data triangulation procedures were used to estimate the market size of segments and subsegments. In the secondary research process, various secondary sources such as Hoovers, Bloomberg BusinessWeek, and Factiva were referred, to identify and collect information for this study. These secondary sources included annual reports, press releases & investor presentations of companies; white papers; certified publications & articles by recognized authors; gold standard & silver standard websites; regulatory bodies; trade directories; and databases. The optical film market comprises several stakeholders such as raw material suppliers, processors, end-product manufacturers, and regulatory organizations in the supply chain. The demand side of this market is characterized by the development of various applications such as television, smartphones & tablets, desktop monitors & laptops, and automotive display. The supply side is characterized by advancements in technology and diverse applications. Various primary sources from both the supply and demand sides of the market were interviewed to obtain qualitative and quantitative information. n The key players in the industry and markets were identified through extensive secondary research. After arriving at the overall market size using the estimation processes explained above, the market was split into several segments and subsegments. 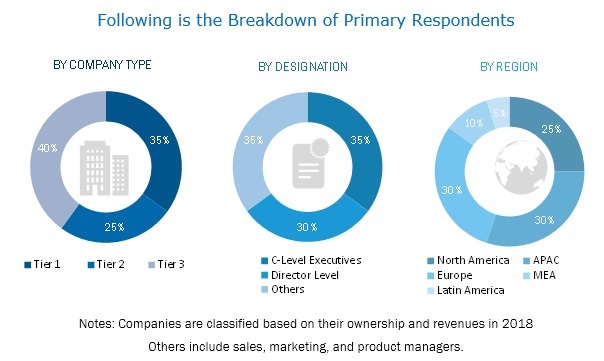 The data triangulation and market breakdown procedures were employed, wherever applicable, to complete the overall market engineering process and arrive at the exact statistics of each market segment and subsegment. The data was triangulated by studying various factors and trends from both demand and supply sides in the television, smartphones & tablets, desktop monitors & laptops, automotive display, and other applications. LG Chem, Ltd. (South Korea), Hyosung Chemical (South Korea), Toray Industries Inc. (Japan), Sumitomo Chemical Co., Ltd. (Japan), 3M (US), Zeon Corporation (Japan), Kolon Industries Inc. (South Korea), Sanritz Co., Ltd. (Japan), Nitto Denko Corporation (Japan), and Samsung SDI (Japan). This research report categorizes the optical film market based on film type, application, and region.